After a thorough examination of five of the best broadcast spreaders on the market, we’ve found that the best fertilizer and grass seed spreader is the Goplus Broadcast Spreader. Out of the various products reviewed here, the Goplus Broadcast Spreader is a medium-range model that is not too expensive, easy to use, and durable. 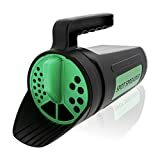 It holds grass seed and fertilizer, includes instructions and tools, and can last for years despite having a low price. For further information on the Goplus Broadcast Spreader, see the Product Reviews section below. A close second place to the Goplus Broadcast Spreader is the Agri-Fab Push Broadcast Spreader. This product is heavier than most others, easy to push, and can hold a large amount of product. 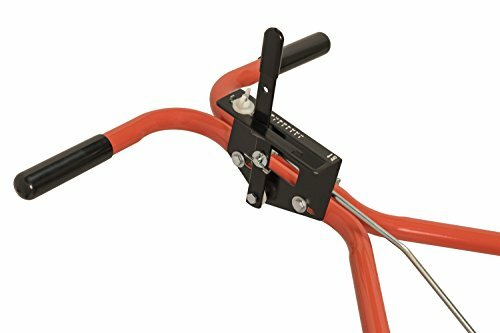 It is adjustable and durable, and it works great on large lawns. The main issue is that it is expensive compared to other grass seed and fertilizer spreaders, which is why it comes in second place to the more economical and reasonable Goplus Broadcast Spreader. But, if you don’t mind the price, it’s a great option. For details on the Agri-Fab, see the Product Reviews below. Not everyone can afford pricy equipment, but most people still want a luscious lawn. For those on a budget, the best option is the Spot Spreader Hand Spreader/Shaker. Because of its low price, overall durability, and lifetime warranty, it is the best spreader for those on a budget. To learn more about the Spot Spreader, see the Product Reviews section below. Unless someone is a beautiful spring nymph flinging the season’s seeds throughout the glorious sunlit landscape, nobody is fond of spreading grass seed by hand. And gardeners are especially irritated if they need to cover the ground in fertilizer using their bare appendages. Ick! 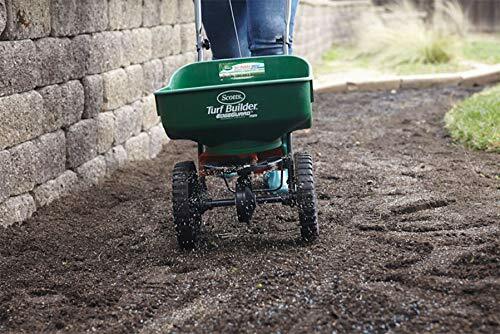 For those situations when the garden or lawn need tending and hands just won’t do, it’s time to pull out the broadcast spreaders for grass seed and fertilizer. These devices can be pushed or carried and will make it easy to evenly spread garden materials around the yard. With so many manufacturers making grass seed and fertilizer spreaders, it can be difficult to find the best one. For this reason, we’ve put together this review of five of the most popular models of push and handheld spreaders to identify those that work the best and those that should be avoided. We’ll start with a comparison table, then move into individual reviews. We’ll conclude with our favorites. Product Dimensions: 18.6 x 19.6 x 15.8 in. The Scotts Turf Builder Edgeguard Mini Broadcast Spreader is a medium-sized grass seed and fertilizer spreader. The device weighs roughly 10.5 lbs, and the wheeled-design makes moving it around pretty easy. It needs to be pushed by hand in a manner similar to a wheelbarrow. The main barrow section can hold enough product to cover roughly 5,000 sq. ft of area. This particular spreader works with grass seed, fertilizer, road salt, and ice melt for driveways and sidewalks. The Mini is green, orange, and black, and includes the Scotts’ Edge Guard Technology, which is supposed to stop substances from slipping out the sides of the main barrow/bucket section. Some assembly is required when purchasing the Scotts Turf Builder Edgeguard Mini Broadcast Spreader. The wheels need to be attached to the base and the entire product comes with instructions for assembly and basic use. The instructions need to be followed to prevent too much grass seed, fertilizer, and other substances from clumping or spreading unevenly. The Scotts’ No Quibble Guarantee states that if you’re unsatisfied, they will send you a check for your money back for the spreader. At a first glance, the Scotts Turf Builder Edgeguard Mini Broadcast Spreader seems like a good deal. However, there are some issues that put this product in the questionable list. Due to some recent changes in manufacturing, many buyers have found this new broadcast spreader is cheaply made and falls apart easily. 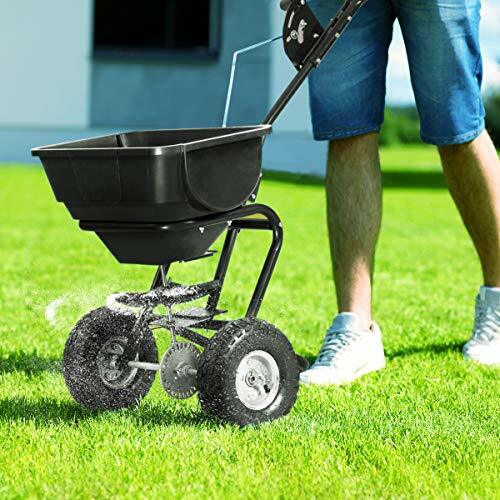 When testing the product with sample fertilizers and treatments, it was found that it does not spread material well and often drops entire clumps of substances that can wind up burning the lawn. This is because the shafts through which material is supposed to fall often do not stick in place, leaving larger than normal gaps that materials fall through. Covers Roughly 9,500 sq. ft. Product Dimensions: 36 x 22 x 35 in. The Goplus Broadcast Spreader is a plastic and steel grass seed/fertilizer spreader made by Goplus. 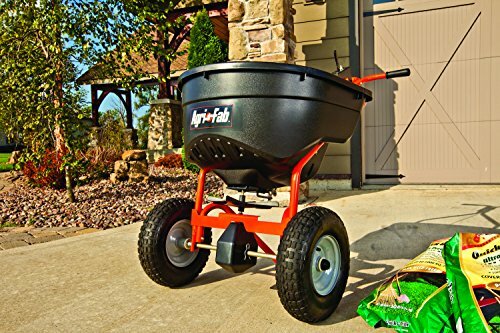 This is another wheeled spreader with rust-proof poly construction, meaning it is heavy duty and should be able to stand up to the average person’s lawn treatment needs. This particular model is pitch black and features a hopper/barrow capable of holding 55 lbs. of material for spreading. This 55 lbs. Should be able to cover roughly 9,500 sq. ft. Note that there is a smaller and cheaper model that can hold roughly 7,500 sf of material, as well. The Goplus Broadcast Spreader features full dimensions of 36 x 22 x 35 in., which is large enough to hold a reasonable amount of material but still small enough for the average man or woman to push without too much trouble. Each product comes with instructions as well as tools designed for the spreader. There are multiple settings to control how much product is spread on the lawn. This spreader is designed to hold only grass seed and fertilizer and NOT road salt or ice melt. The Goplus Broadcast Spreader is one of the best pushing grass seed and fertilizer spreaders currently available. Although larger than some of the other models in this review, it is the most durable product and also has one of the largest capacities. The included tools are great and can help users tighten their settings to ensure the proper amount of product is released onto the lawn. The price is also reasonable considering the spreader’s size and capabilities. Overall, this is an excellent grass seed and fertilizer spreader that far outshines its smaller cousins, especially given its price point. Product Dimensions: 4 x 6 x 13 in. The Spot Spreader Hand Spreader/Shaker is different from the other grass seed and fertilizer spreaders on this list. Instead of being a model that is pushed like a wheelbarrow, this product looks a lot like a large salt shaker or coffee can. It is held in one hand and can be used to spread seed, fertilizer, and road salt across small areas. Despite its size, this is an extremely durable spreader that is also lightweight and easy to use. Its full dimensions are 4 x 6 x 13 in. and the whole product only weighs 9.6 oz. when empty. Easy to carry! The Spot Spreader Hand Spreader/Shaker is green and black and features three separate settings to determine spreading thickness. These settings can be adjusted similar to a spice jar and then sealed in place until the user wants to change them again. This particular spreader is the most versatile with the materials it can hold. According to the manufacturer, the spreader can hold grass seed, fertilizer, de-icer, ice melt, and earth food or plant food. A lifetime warranty is included with each purchase. This product seems simple and it is, but this is not a bad quality. 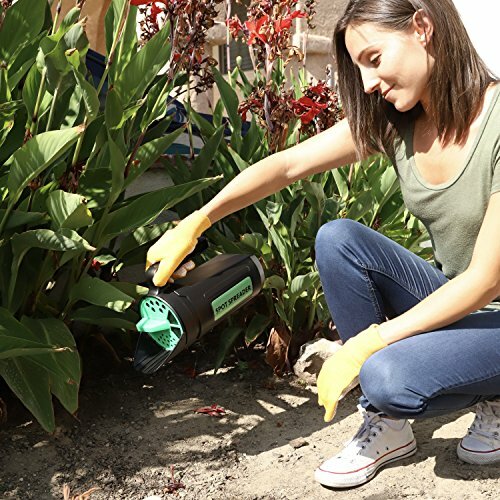 Although the shaker has to be used by hand, its versatility, lifetime warranty, low cost, and overall durability makes it a great investment for people who don’t own a lot of property but would still like to be able to spread the necessary treatments and substances in the garden or on the grass. 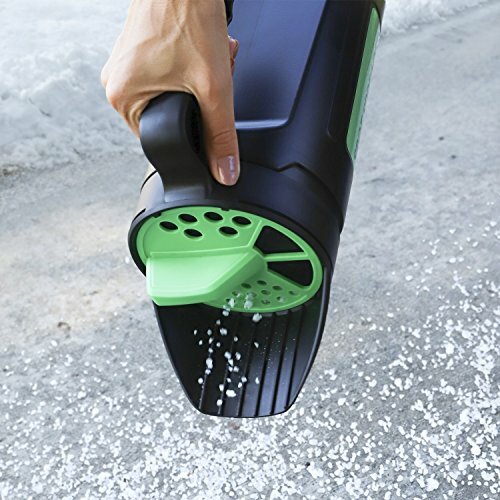 The Spot Spreader Hand Spreader/Shaker also works with ice melt and other products, making it a great investment. For all of these reasons, this unit is our Budget Choice. Lifetime * No Questions Asked Money Back * Enjoy One Today! ! ! Product Dimensions: 13.4 x 15.7 x 25.2 in. The Chapin 84700A 25-Pound Professional Bag Seeder (Chapin Professional Bag Seeder) is another unusual grass seed and fertilizer spreader that sits on the shoulders and can spray materials across a yard or lawn. The product features a shoulder strap/bag design that utilizes a single strap and rests comfortably around the shoulders and upper back. The strap is padded and adjustable for comfort, and the whole product is convenient and easy to use. 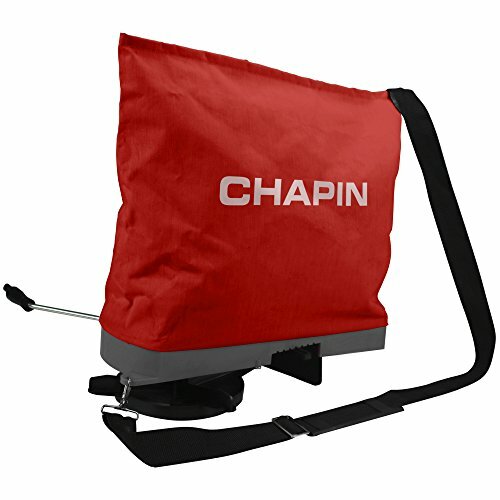 The Chapin Professional Bag Seeder features a red and black design that includes a motor sealed away for convenience and safety. A rear baffle is attached to the bag to prevent seeds and fertilizer from falling into your pockets. That said, wearing a seeder is a bit awkward, and you’re almost certainly going to get covered in fertilizer or grass seed as you use this unit, so be aware. The seeder is portable and weighs a surprisingly light 3.8 lbs. The bag holds 25 lbs. of material and works best with seeds and granular fertilizers. The Chapin is covered under a 1-year warranty. The Chapin Professional Bag Seeder is a convenient seeder for individuals with medium-sized yards and reasonably strong backs. It is slightly limited in the materials it can spread because of its function and design, but is durable and easy to use. The only issues with this seeder are the awkwardness of having to wear the seed spreader and the lever design. The lever used to adjust the seed flow struggles to stay in place, meaning it can be difficult to spread materials effectively. For this reason, the Chapin Professional Bag Seeder loses out to the Goplus Broadcast Spreader and the Agri-Fab Push Broadcast Spreader. Covers Roughly 25,000 sq. ft. Product Dimensions: 18.9 x 10.7 x 13.2 in. The Agri-Fab 45-0462 Push Broadcast Spreader (Agri-Fab Push Broadcast Spreader) is a powerful push grass seed and fertilizer spreader. 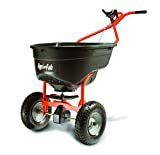 This particular product is red and black, and features a rust-proof poly hopper and pneumatic tires for easier pushing and movement. Each spreader has a tapered and beveled gearbox to prevent injuries and keep the mechanics protected. 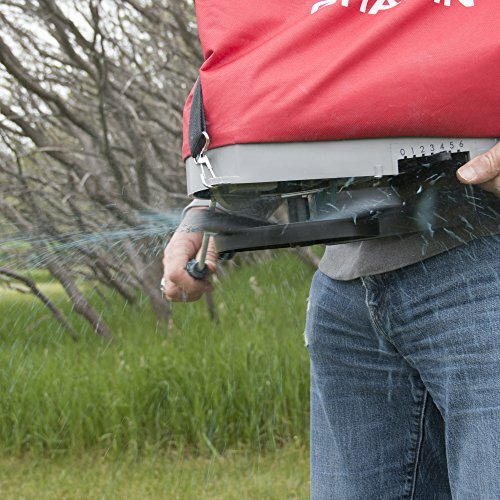 The Agri-Fab Push Broadcast Spreader is the largest model on this list, coming in at 35 lbs. With a whopping 130 lb. hopper/barrow capacity. It can hold enough product to cover roughly 25,000 sq. ft. and has full dimensions of 18.9 x 10.7 x 13.2 in. A warranty is available from the manufacturer but not included in the initial purchase. An optional cover is available for the hopper but not included in the standard purchase. Some assembly is required upon purchase before the spreader can be used. An assembly manual and a user guide are included with the product. The Agri-Fab Push Broadcast Spreader is a durable, reliable product that can hold a lot of material and spread it evenly across yards and lawns. It is rust-proof and easy to push despite its weight because of the pneumatic tires and poly structure. 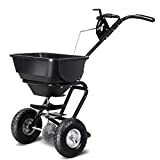 The only downside to the spreader is its high price point, which makes it difficult for the average person to purchase and downright foolish if the individual does not own a large lawn. For this reason, it comes in second place to the Goplus Broadcast Spreader. If you can find this unit on sale, it is a great option. Grass seed and fertilizer do not need to be applied by hand. Instead, it’s certainly a good idea to pick up a reliable grass seed and fertilizer spreaders that is appropriate for your needs, lawn size, and budget. 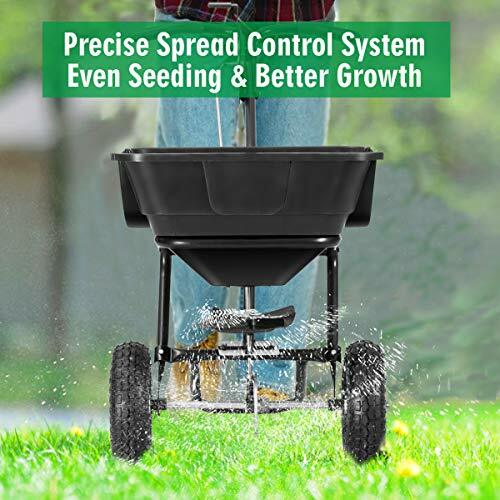 For the average homeowner, the best product available is the Goplus Broadcast Spreader. 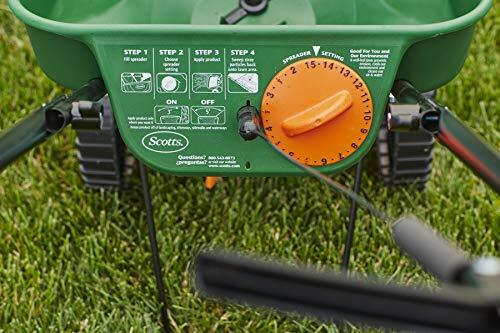 It’s a good scale for most lawns, works well, and hits a reasonable price point. An excellent option for large lawns (if you can stomach the price) is our runner-up, the Agri-Fab Push Broadcast Spreader. For those on a budget who have small lawns, the Spot Spreader Hand Spreader/Shaker is fantastic. Taking care of a lawn doesn’t need to be difficult or time-consuming. Get a spreader and make treatments as easy and simple as pushing a wheelbarrow or seasoning the lawn like a fine steak.